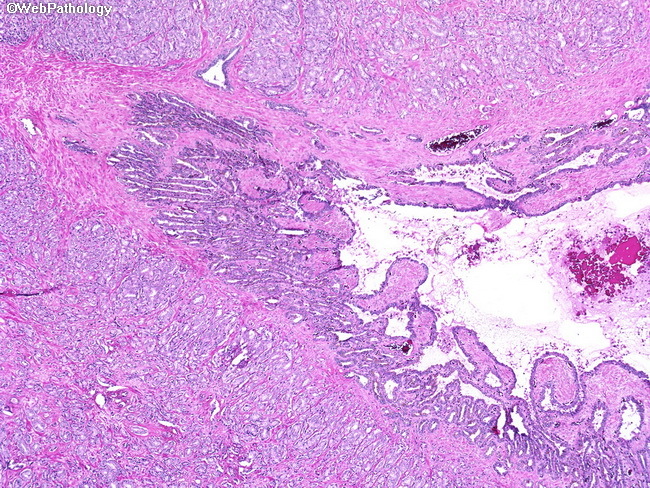 Low magnification view from a radical prostatectomy specimen showing extensive involvement of the muscular wall of seminal vesicle by prostate cancer. The seminal vesicular epithelium itself is spared. The most common route of spread of cancer to seminal vesicles is extraprostatic extension into periprostatic soft tissue near the base of the gland followed by invasion into the seminal vesicle wall.